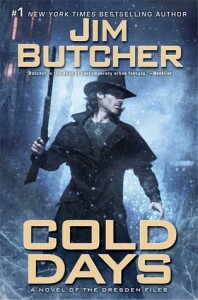 The latest in Jim Butcherâ€™s ever popular series about the modern-day wizard Harry Dresden is a gripping page turner.Â Very different from the television series that graced Sky One back in 2007 and was cancelled after just one series, this is considerably darker. Harry Dresden was Chicagoâ€™s only professional wizard, but has since been killed, spent some time as a ghost, and been brought back to life in service to Mab, the Winter Queen.Â Now he is the incarnation of the Winter Knight, a powerful force within the faerie world, and bound to do Mabâ€™s bidding. Harry finds himself in a world of confusing politics, being threatened by a myriad of faerie entities, but backed up by his apprentice, half-brother and various other allies.Â He must try to unravel the politics, save his friends, avoid being killed and prevent Chicago from being wiped off the map. Butcherâ€™s prose flows effortlessly, and the reader finds themselves swept into the storytelling, lost in Dresdenâ€™s world.Â Gritty, full of humour, action and snappy dialogue, Cold Days is definitely worth a read.Â If youâ€™ve never met Harry Dresden before, nowâ€™s the time.